There was a Manson murder in my home town. Stockton is usually considered a backwater. It’s an agricultural town with a little light industry here and there. The two things most people remember about it? The first big schoolyard shooting took place here about 25 years ago, and now the place is bankrupt. Basically, it’s the kind of place people avoid because Fresno is classier. And less dangerous. 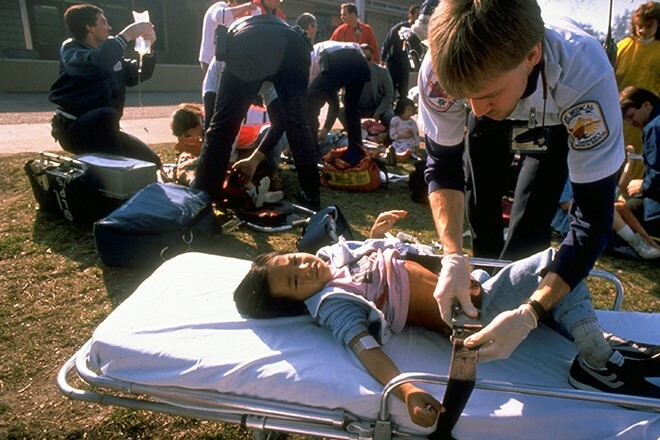 Stockton is, after all, now rated as being “safer” than only 3% of American cities. Your chances of becoming the victim of a violent crime here are one in 64, compared to one in 236 for California as a whole. It’s always been a rough and ready kind of town, and not just because of the naval base that used to sit on Rough and Ready Island, a bit further into the Delta west of town. Remember that old TV series, the Big Valley? Some of the sleazier stuff in that one happened on Stockton’s waterfront, and a lot of it wasn’t so fictional. Sailors were shanghaied, and traffickers dealt in all sorts of things. Opium dens were connected by tunnels that still exist in some parts of what used to be Chinatown. 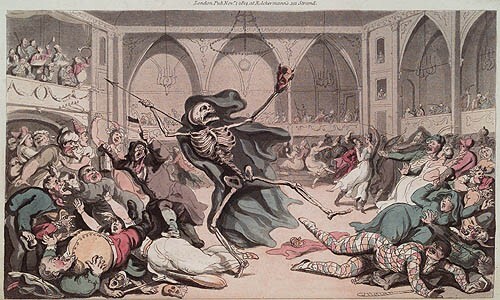 By the 1940s, the place was wide open as far as drugs and booze and ladies of ill repute were concerned. 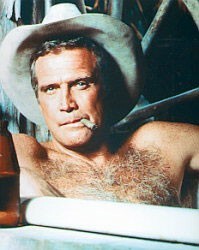 For a young and hunky Lee Majors, The Big Valley was his big break… not least because as “Heath” he was often shirtless! Still, so far as I know, Charlie Manson has never set foot within the city limits. Or has he? In March of 1967, Manson was released on parole from a federal prison on Terminal Island, in L.A. He was given permission to relocate to San Francisco, where the Summer of Love was about to get started. He wanted to be a musician. In fact, he’d been taught how to play a steel guitar by a fellow inmate, none other than Alvin Karpis, a famous bank robber of the Great Depression. 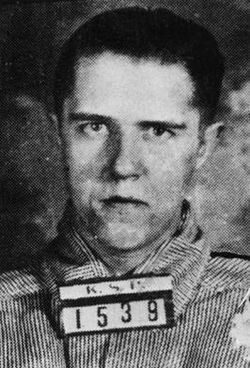 Alvin Francis Karpis (August 10, 1907 – August 26, 1979), a Depression-era gangster nicknamed “Creepy” for his sinister smile. Charlie didn’t have much luck plying that trade, however. He got by on panhandling. Then he took up with Mary Brunner, a 23-year-old library assistant at UC Berkeley. Manson moved in with her, and then talked Brunner into allowing other women to move in. Eighteen of them. By the end of the summer, Brunner was pregnant, and Manson had turned himself into a guru. Together with eight or nine of his devotees, he got hold of an old school bus and did it up hippy-style, replacing the seats with brightly colored rugs and pillows. The group wandered on up to Washington state, then moved southward again, all the way down to Mexico. So, yeah. Manson could have passed through Stockton. He pretty well had to, since Interstate 5 just didn’t exist in this part of the Central Valley yet. That left him with only three north/south choices – the Pacific Coast Highway or U.S. Routes 101 and 99. The coast road isn’t school bus friendly for several long and ultra-curvy stretches. U.S. 101 is better, but turns pretty narrow and curvy too, by the time you get up to Oregon. Rte. 99, however, cuts through this berg like a meat cleaver. 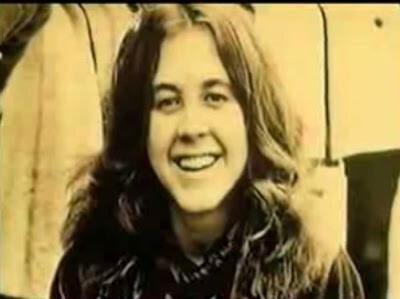 In 1967, Manson looked more like this…………….…….…..…than this. 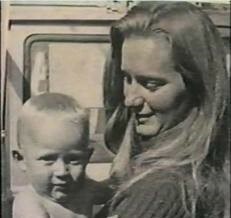 Mary Brunner gave birth to her son on that bus, reportedly while smoking weed to help her relax. The group, after all, saw no need for prenatal care, for hospitals, birth certificates, or vaccinations. She named her son Valentine Michael Brunner, an obvious reference to Valentine Michael Smith, the hero of Robert Heinlein’s novel, Stranger in a Strange Land. I don’t know whether Manson ever read the book, but Stranger was pretty damn popular with the younger generation about then, especially hippies. 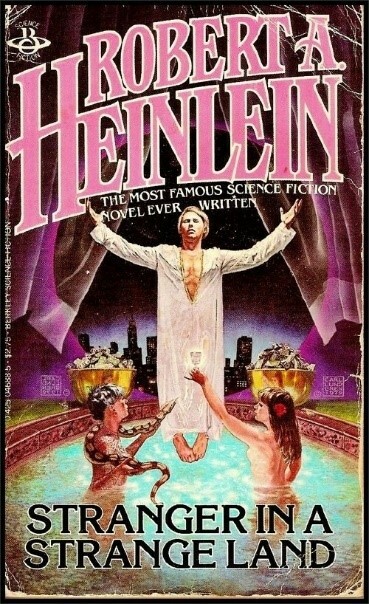 I’m sure Heinlein would not have approved. He grew hugely annoyed with the people who kept turning up on his doorstep, wanting to camp out on his property (for free, of course) and try to grok the universe with him. boy, Valentine Michael, in 1968… himself in this role…. To my further surprise, I discovered that Valentine had a childhood nickname: Pooh Bear. My family nickname is Pooh Bear, damn it! And I’m not sharing. Not with the Manson family. Maybe I did spend some time in the City while Charlie was there, and maybe the family did kill somebody on my turf. 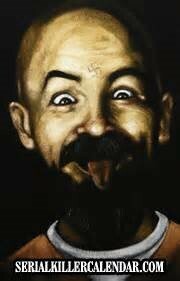 Maybe an ex of mine did time at Corcoran State Prison while Charlie was there. But that’s it – no more little coincidences, y’hear me? The Universe, as always, just laughs up its sleeve and refuses to answer. All I can do is turn back to the subject of my quest – the body in the basement. That happened in 1972. What the heck was going on back in 1972? This was after Manson’s trial. That ended in 1971, despite nearly endless disruptions in the courtroom and the disappearance of a defense lawyer (Ronald Hughes – you’ll hear more about him later). On April 19, 1971, Judge Older sentenced Manson and all three of the women tried with him (Susan Atkins, Linda Kasabian and Patricia Krenwinkel) to death. Tex Watson, tried separately, received the same sentence in November of that year. And in February, 1972, those five death sentences were all reduced to life in prison. That’s because the California Supreme Court abolished the death penalty by way of California v. Anderson, 493 P.2d 880, 6 Cal. 3d 628 (Cal. 1972). Which is why Manson and co. are even eligible for parole. In theory, anyway. You see, in a separate 1971 trial, Manson had also been found guilty of masterminding the murders of Gary Hinman and “Shorty” Shea, and drew a life sentence for those two killings. So Manson had ten murders on his sheet. He also had half the family still on the street. Or on the road. And some of them were hanging out in Stockton. Still, the killing there was only uncovered because of another. 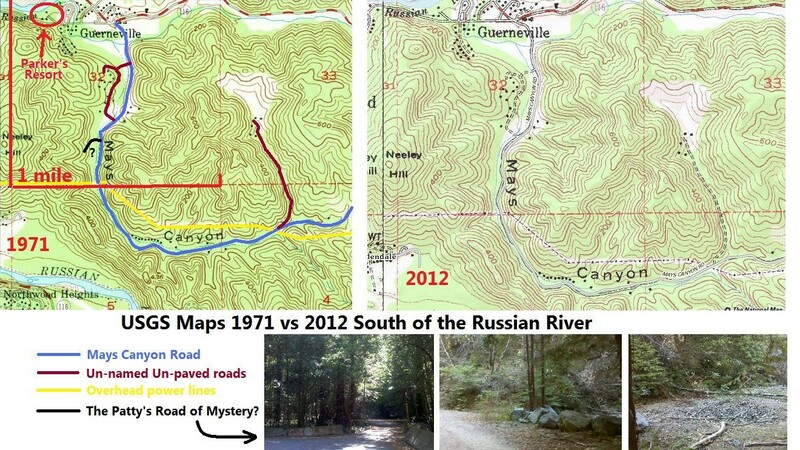 On November 8, 1972, near Guerneville, an older fellow named Robert W. Stevens was hiking on an old logging road near the Russian River when he noticed a hand sticking out of the ground. Parker’s Resort is where a subsection of the Manson Family stayed for about a month in October of 1972, including the Willetts. The headless body was found in a clearing NE of the mountain peak embraced by Mays Canyon (just follow the red line north on the map to the left). The 71-year-old Stevens reported his discovery to the Sonoma County Sheriff’s Office, and deputies dug up the badly decomposed remains. Whoever put the body there hadn’t done a good job of it, failing to dig the hole deep enough and doing nothing at all to disguise or secure the site. That’s why the corpse had the one hand exposed. As it turned out, the other was missing, along with his head. The work of scavengers, said the Deputy Coroner. The Sheriff’s Office had been searching for a body just a week before that, supposedly the victim of a different sort of “family” – the Hell’s Angels. While three bodies were eventually located in other parts of the county (and linked to a biker called George “Baby Huey” Wethern), this particular search found nothing of note, and that site was clear across the Sonoma Valley from the one Bob Stevens stumbled across. Plus, the headless body was wearing the tunic from a Marine’s dress blues. As far as I can tell, NCIS did not get involved, in spite of the uniform. It was detectives from the Sonoma Sheriff’s Office who finally identified the body as the remains of James L. T. Willett (apparently no relation to the James P. Willet who is San Joaquin County’s District Attorney at the moment – that’s just another weird little coincidence). The 26-year-old and very dead Willet was a former Marine, a Vietnam combat veteran who’d received an honorable discharge in L.A., taught ESL classes to immigrant kids, and then somehow fell in with the Manson family. It would later turn out that he had been forced to dig his own grave before he was shot with a .38 caliber handgun and buried in it. The first person to be connected to Willet’s murder was an ex-con named Michael Lee Monfort. He was a member of the Aryan Brotherhood prison gang, with whom Manson had formed an uneasy alliance while on Death Row. 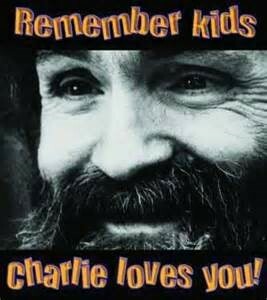 Rumor has it Charlie did so by becoming the submissive partner of another gang member also confined at San Quentin. Monfort used James Willett’s identification after he and William Goucher Jr. were arrested for robbing the Eden Square Liquor store at 929 N. El Dorado St. in Stockton. Since Willett had no criminal record, and his family owned Kentucky Bourbon Distillers (in Bardstown, Kentucky), Monfort would have looked like a fairly good risk to a bail bondsman. This, even though $10,000 back then was about half the price of a modest 2-bedroom house (it would be worth roughly 54 to 55 grand in today’s dollars). 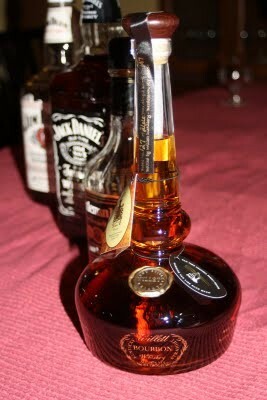 Willett Pot Still Reserve is first rate Bourbon and runs $45-$50 bucks a pop. The bonding company would have demanded a 10% fee in cash or kind to secure the bond. They would have checked with the DMV for a vehicle in Willett’s name that could be used as an asset. They might have even checked with Willett’s family about his old addresses. One of them would have matched the address on his ID: 704 ¾ Coronado St., Los Angeles, CA. The end result? Monfort got away with his impersonation of Willett. There was no automated system then for confirming his identity through fingerprints. So Monfort walked, and promptly skipped, while Billy Goucher stayed in the pokie. Jim Willett’s body turning up brought things into focus, however, especially when Stockton cops looking for Monfort located the dead man’s station wagon outside a house in Stockton. Stockton police came back with a warrant for Montfort, but had the door slammed in their faces by a woman inside. The officers kicked the door in and dropped on the people inside, including Monfort and another Aryan Brotherhood member – James Terill “Spider” Craig. The two women present had Manson’s X carved into their foreheads: 21-year-old Priscilla Cooper and 20-year-old Nancy Pitman (also known as Brenda McCann). 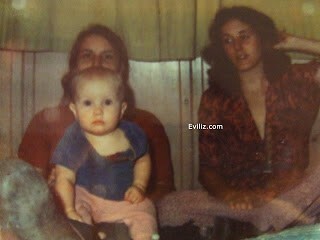 The cops also found an 8-month-old baby girl who turned out to be Heidi Willett, the dead man’s daughter. 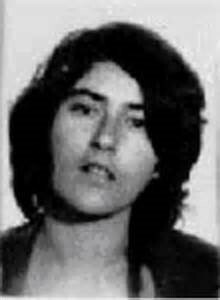 Nancy Pitman, AKA Brenda, was once described by Manson as his leading candidate for Family assassin. A few minutes after the police made entry, another woman called the house asking if someone could pick her up and give her a ride to the house. 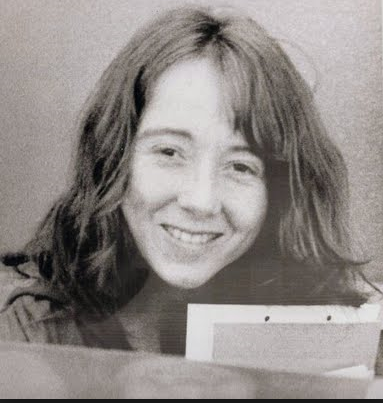 The cops obliged, and soon took Lynette, better known as “Squeaky” Fromme, into custody. Inside the house, police found a number of weapons, including a sawed-off shotgun, and James Willet’s discharge papers. They also noticed extension cords running across the floor to a trap door that gave access to the basement. When they looked further, they found freshly turned earth underneath the house. Investigators raised their eyebrows at that and decided to obtain a fresh warrant. Around 5 a.m. the next morning, they exhumed the body of 19-year-old Lauren Chavelle Olmstead Willett, nicknamed “Reni” by the group. She was James Willett’s wife and Heidi’s mother, and she had been shot in the head. “Reni” Willett, holding Heidi, while “Brenda” looks on. 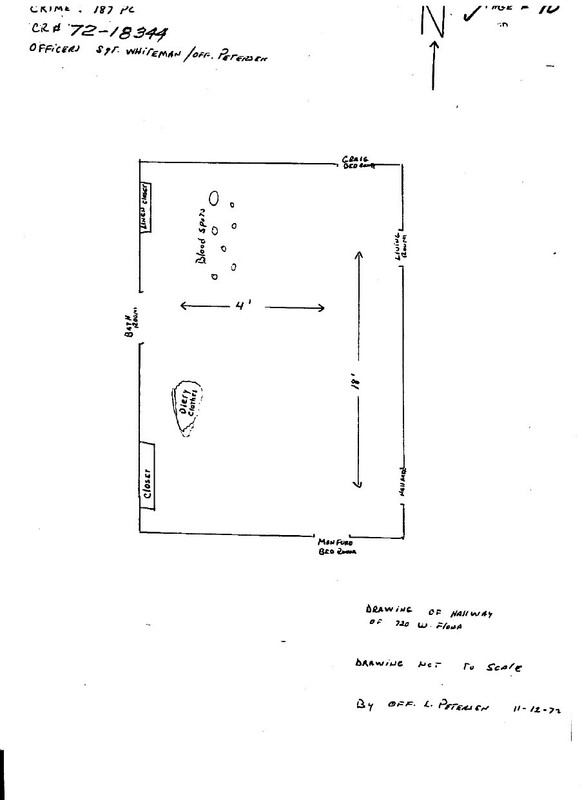 A sketch of the ground floor of the house at 720 W. Flora, showing where blood spots were found on the floor. 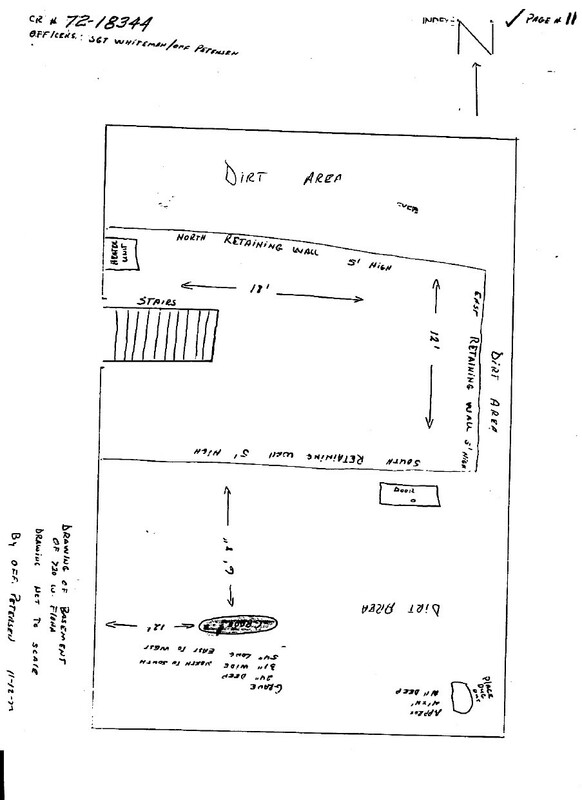 A sketch of the basement at 720 W. Flora St., showing where the body of “Reni” Willett was found. The body had been there no more than 24 hours. The cause of death: a gunshot wound to the head. Then, after the body in the basement was discovered, Priscilla Cooper told the police that “Reni” had accidentally been shot by Monfort while he was explaining how dangerous it is to play Russian roulette. That didn’t explain why she was buried in the basement, however, and the timeline was so tight. So…suggestive. Jim Willett is last seen alive, near Guerneville. Brenda, Priscilla, Reni and baby Heidi, along with Mike Monfort, Spider Craig and Billy Goucher all arrive in Stockton by means of Jim Willett’s white 1965 Ford station wagon. They rent the house at 720 W. Flora. Mike Monfort and Billy Goucher busted for robbing a liquor store twelve blocks away, at Eden Square. Monfort makes bail. Goucher doesn’t. Jim Willett’s body is found in Guerneville. Monfort Fails To Appear (FTAs) in court on the armed robbery charge. Reni Willett is killed. Squeaky Fromme gets off the bus in Stockton. Squeaky visits Billy Goucher in jail. Later that day, Willett’s station wagon is spotted, around 8 p.m. Monfort et. al. are arrested. Squeaky Fromme turns up and admits to having spent Friday night (the 10th) at the house on Flora Street. Squeaky’s returned to the very same facility where she’d gone to visit Goucher. Reni’s body is dug up. A suspicious mind might wonder whether someone in the vicinity of Guerneville heard about the headless body being found and somehow communicated that information to the folks who were by then hanging out on Flora Street, in Stockton. Within a day of that news breaking, Willett’s wife was killed. 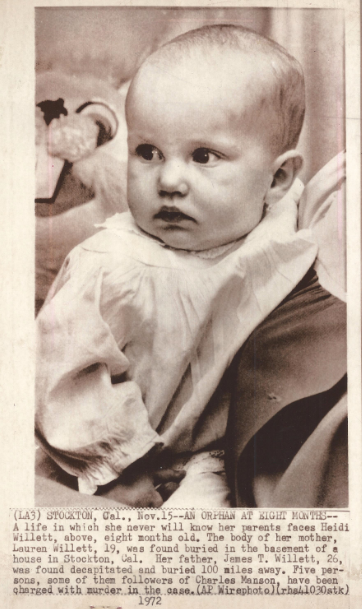 That left only the 8-month-old Heidi as a witness to whatever the rest of the group had been up to, in Guerneville, in Stockton, in various other parts of the state. Little Heidi, thank God, came through all this unharmed. She was taken to Mary Graham Hall, the children’s shelter for San Joaquin County, and later turned over to relatives. From what I’ve heard, she was raised by her mother’s parents (with the approval of the Willetts). At last report, she is doing well. The big unanswered question about all this? What was all this about? Why kill Jim Willett to begin with? Thanks! I’ll do my best to keep it interesting, so I don’t get bored!